Or to give it the full title: G’olé!, The Official Film Of The 1982 World Cup. Released two years after the tournament, this documentary looked at the events in the 1982 World Cup in Spain. As I said excellent description/review which paints a very good picture. And we have to visualise it because sadly, it was on YouTube at one time but those fine upstanding respectable FIFA lawyers have gone in with a takedown notice. [See below] You might catch it on ESPN Classics on the odd, rare occasion or find a knock-off copy via ebay. Remember though as you read from the above review the clip is nothing like the documentary. They very much differed because of the person who recorded the voiceover – and – here is the angle of interest to us at F&M – the musician they hired to compose a soundtrack. That musician was the keyboard player for what was known as back then as a dinosaur bands who played they pompous rock operas where the solo’s when on for about half an hour. And with his band because of the type of music they performed, he made sure it was the keyboard solo that got all the attention. Step forward the purveyor of prog rock, the wearer of ridiculous capes. 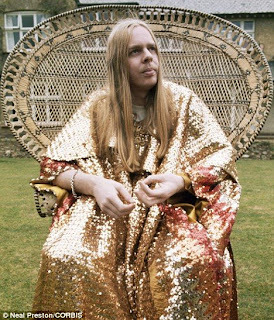 The keyboard player for Yes + Anderson Bruford Wakeman Howe – Rick Wakeman. Wakeman is a big supporter of football. At one time he was director of his favourite club Brentford FC. He was also involved in the ownership of the American soccer club Philadelphia Fury in the late ’70s, along with other rock celebrities such as Peter Frampton and Paul Simon. After the ’82 World Cup finals Rick began composing, but sadly according to some, a mediocre soundtrack. “Wakeman himself has called this an album for collectors only and I’d be hard pressed to disagree with him as quite a bit of the music presented here is considerably lightweight and fairly mediocre at best of times. That being said, it’s certainly not as bad as it might seem primarily due to Rick’s brilliant flourishes on the grand piano, something he does quite a bit of on this disc. Where this really works is on tracks “Wayward Spirit” “No Possible” and the beautifully symphonic sounding melodies of “Black Pearls”. The fact that the 1982 World Cup was held in Spain accounts for the noticeably Latin influence on numbers “Latin Reel (Theme from G’olé)” and the tasty flamenco flavoured guitar work of guest players Jackie McAuley and Mitch Dalton on “Spanish Message”. https://www.footballandmusic.co.uk/fandmxi/Gole%20Soundtrack%20-%20G%27ole!.mp3 » G’ole Soundtrack – G’ole! Oh and the person who did the voiceover ? Sean Connery. By far the greatest soundtrack to a football film ever (in my opinion), but that might be only because I grew up to it. I spent years of my life tracking down the CD and LP iterations of this album. I could listen to Spanish Montage all day. But who could possibly review it as anything other than mostly a background soundtrack to action and commentary? I never had the impression that it was supposed to stand along as its own album, so I guess thats why it was never disappointing to me. Thanks for posting!